The Russian voice of horse liberation and Haute Ecole at Liberty - without force or even a bridle ! A "must see" website! - Check out the "Horse Trade Union" page and look those horses in the eye! is located in Whittlesea, Victoria, Australia. A balanced view in all the confusion, presented by John Stewart MA VET MB MRVCS. Equinoxe Equestrian is committed to making a significant contribution to equestrian sport in Australia, with a particular focus on dressage. With an exemplary record of achieving the highest training accreditation, our resident dressage instructor, Catherine Birmingham, has a specific talent for communication and passionate dedication to her clients and their horses. Catherine's approach is a balance between left and right brain communication - with a synergy between logical, structured thinking and a gentle, holistic approach toward nurturing the growth of both horse and rider as one. She is focused on encouraging the principles of the German Training System. 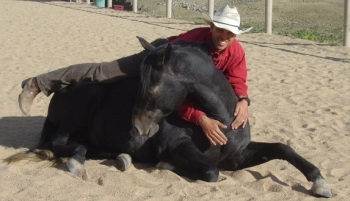 Equine Positional Release classes, working with horses in Australia, NZ and USA. 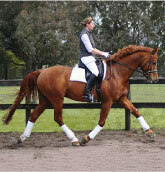 Michelle is the resident instructor at the fantastic venue "Arcacia Park" (Langwarrin South) but also travels nationally and internationally to conduct clinics and workshops to help the rider to develop greater body awareness, suppleness, coordination, improved muscle tone and greater sensitivity in relation to the horse. It is a skill that may be used to improve position and as a result, a more fluent application of the aids to promote a harmonious connection with the horse. The Alexander Technique is a skill that can be learned and applied in daily activities improving balance and coordination. An educational process which facilitates greater understanding of how thought and movement impact on performance.